We spent a great part of the morning today … “managing a medical issue.” Nothing terribly urgent, but one of those things that if you get it wrong, the consequences can be fatal. It wouldn’t be appropriate for me to live blog about it, so as to protect the confidentiality of the patient and the Montana High Adventure Base, but we are monitoring our patient under the close consult of our Camp Director and Health Officer via sat phone. There is no drama at this time and “the issue” seems to be resolving itself. We are otherwise proceeding along our route normally and we are in fine health overall. This evening, our patient is happy and feeling much better. Any talk of wilderness medicine is interesting and engaging for our participants. All of us (youth and adults) hold active certifications in Wilderness First Aid or higher and we are fascinated by everything from internal medicine to the skin peeling between our toes (“packrafter toes”). After a late start from camp as the temperatures began to climb, we finished our descent into the beautiful White River valley. After reaching the river and turning north, we enjoyed the wettest miles of the trek. The White is flooding its banks and carving new channels near Brushy Park, and in some locations, the river is sharing a side channel with our trail. Hip-deep river crossings, walking through mucky side channels, schwucking through mud bogs, and icy cold water that numbs the feet – these were today’s defining moments. 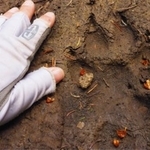 Our footprints followed grizzly bear and wolf tracks the entire day today. Many of those tracks were fresh in the mud. We have yet to see a bear on this trek, but we did notice a “brown thing” on the hillside above us … that disappeared a bit later when we tried to find it again. We are camped in a meadow adjacent to the river and far away from the main trail. An 80 foot tall lone pine stands sentinel in the meadow and provides our shade while we rest and scout the beginning of our route to the northern crest of the Chinese Wall, which looms 2,000 feet above us directly to the east of our camp. We have now traveled a little more than 70 miles and have about 35 remaining. Tomorrow morning we make the 2,000 foot climb to the crest of the Chinese Wall and begin our off trail traverse to White River Pass, which we hope to reach in a couple of days. In preparation for what will be a tough but spectacular few days, we are playing hearts, cooking noodles, and dropping a fly in the stream for one of the little cutthroats that inhabit this icy river.